One of the stickiest issues as you deal with V-fib is knowing when you should defibrillate the patient and when you should continue with CPR. CPR is obviously necessary for perfusing the brain and the heart muscle, but defibrillation is vital for getting the heart back into a rhythm through which it can perfuse the body itself. As a new provider or as an experienced provider uncertain about the latest changes made in 2015 by the ACLS, you may find yourself unsure of how to treat your patient. Here’s a quick look at V-fib, current and old guidelines for treating it and tips for how you should react when your patient codes. Ventricular fibrillation, or V-fib, is a common cardiac arrest rhythm that’s noted by its wide, wavy pattern without a discernible QRS and with no P wave. It often occurs on its own or following ventricular tachycardia. Without treatment, it can deteriorate to even more concerning asystole or PEA. You should know that V-fib is considered to be the most encouraging cardiac arrest rhythm because most patients caught in this rhythm will survive when treated appropriately. Treatments for V-fib may vary based on whether or not you witnessed the cardiac arrest. If you witnessed the individual go down and you have access to an AED or a defibrillator, the best solution is to shock the rhythm immediately at 360 joules. However, if you’re dealing with unwitnessed V-fib, which more frequently occurs when you’re out in the community, your mode of action may be different. While early defibrillation is still highly recommended, CPR may still be an appropriate first step per current research. A PRIMED trial showed that when cardiac arrest occurs out-of-hospital, outcomes are no different when CPR is done first versus when defibrillation is done first. The point of defibrillation is to turn the rhythm of the heart into a perfusable one. In other words, it should create a pulse and a rhythm with a discernible P wave and QRS complex. This process repolarizes the electrical system of the heart so that the atria and ventricles begin coordinating their pumping again. AHA standards have changed slightly in this matter between 2005 and 2015. Whereas the association once recommended that unwitnessed cardiac arrest required several cycles of CPR before defibrillation in order to perfuse the heart muscle, today’s guidelines state that either option is initially acceptable for unwitnessed arrests. The most important takeaway in this discussion is that defibrillation will be your first step when dealing with V-fib in most cases. Most of the time, as an ACLS provider, you’ll be working with patients who code in a health care setting. 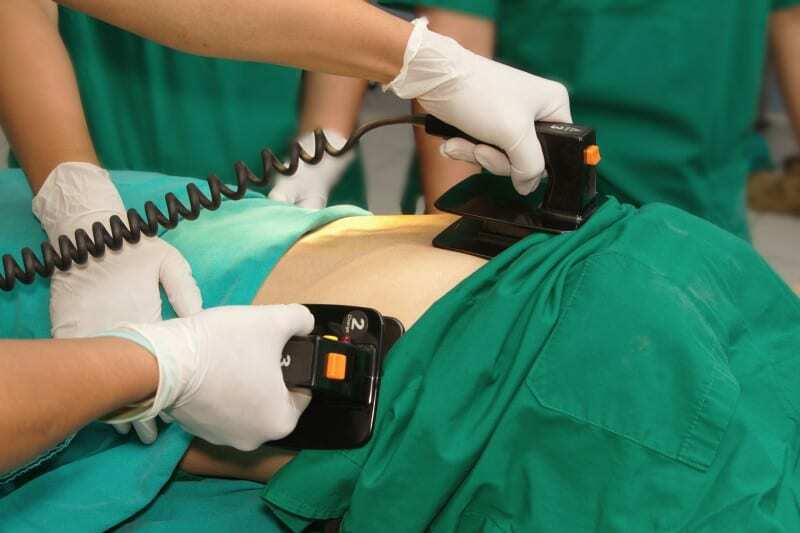 Immediate defibrillation is key under the newest guidelines to improve the chance of survival. In addition, rather than turning to the stacked shocks, which began at 200 joules before increasing to 300 and 360, today, you’re to begin with 360 joules for the best effects. All of this can certainly be difficult to understand. However, the most meaningful point for you is that you should always defibrillate V-fib as soon as possible because this is where the best results for survival lie. Of course, if you’re working as a team, CPR should always begin and continue as recommended by the AHA until your team has the defibrillator ready. Although V-fib is certainly a concerning rhythm and should be treated immediately, it’s the rhythm with the best possible outcome when following ACLS algorithms.